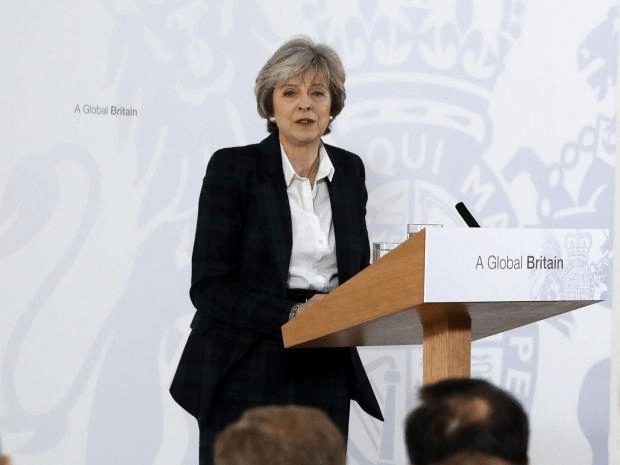 Tired and small: Theresa May’s appearance emulates the way the UK will appear to the rest of the world after Brexit. It is astonishing to see political commentators attempting to take Theresa May’s Brexit speech seriously. They should attack it for the rubbish it is. She said the UK has to leave the European Single Market – but will seek “the greatest possible access to it through a new, comprehensive, bold and ambitious free trade agreement”. In other words, she wants us to be both outside and inside the single market at the same time. We knew that already. Likewise, with the European Customs Union, she said the UK must leave in order to negotiate its own trade deals – but she also wants tariff-free trade with Europe, which isn’t possible outside the customs union. In other words, she wants us to be both outside and inside the customs union at the same time. We knew that already. She said that both Houses of Parliament would be able to vote on any final Brexit deal – but did not explain what kind of vote this would be. Will it be a “take it or leave it” offer – accept what the Tories have negotiated or it’s over to WTO rules for everything? If so, what is the point in asking the Lords – the “revising” house – to consider it, as no revision will be requested or possible? It seems she wants to provide the illusion that our democratic institutions are involved, while actually trying to blackmail them into supporting her. We knew that already, also. One aspect we can all agree we knew already was Mrs Mayfly’s determination to control immigration – despite the fact that, as Home Secretary, she had access to EU-approved controls on immigration for six years and never used them. So her words, that while wanting to continue to attract “the brightest and best to study and work in Britain”, “we will get control over [the] number of people coming to Britain from the EU” ring hollow. Under the EU rules she never implemented, she had power to send EU immigrants back to their own country if they weren’t students, didn’t have a job, couldn’t produce health insurance or evidence that they were using their own funds to live here. So controlling immigration is a non-story. The only thing that ever stopped Mrs Mayfly from controlling EU immigration was Mrs Mayfly. A more plausible reason for leaving the single market, then, is Mrs Mayfly’s determination to stop the European Court of Justice determining matters relating to the UK – but she couldn’t even be honest about this. The European Court has influence only on matters of EU law, and cannot overrule any country on its own national law. Restrictions imposed by the European Court include maintaining workers’ rights, for example, and the quality of goods. Mrs Mayfly wants to scrap UK workers’ rights – and that’s why she wants us to leave the single market. But she didn’t want you to know that, so it seems the Tories have instructed their compliant media to distract us with complaints about immigration instead. Claims that Mrs Mayfly wants to guarantee the rights of EU citizens living in the UK appear to be false, according to information seen by This Writer. Mrs May has said she wants to be able to confirm those rights as soon as possible, indicating that these people are to be considered “negotiating capital” with the EU – but I have seen evidence that at least one EU citizen, attempting to assert those rights recently, was told this was not possible. This suggests that the Conservatives have already decided to curtail those rights. Her claim to protect those rights seems false, therefore, and her promise to develop them in pace with the changing labour market suggests she will remove them as it becomes expedient to her corporate masters. There were good aspects to her speech – but they were common-sense things. Of course the UK and EU should continue sharing intelligence and policing information. That’s about protecting us all from crime and ensuring our national security. But what about the difficulties facing Northern Ireland, where the peace process is about much more than simply maintaining an open land border with the Republic of Ireland? It is all nonsense and waffle. Theresa Mayfly might just as well have stood up and spent her time saying “Blah blah blah Brexit,” over and over again. As far as her tenure in Number 10 is concerned, she should probably start contacting removal companies now. Well the media as ever produced a pro eu hatchet job but the major item was destroying the Millar result by saying that both houses would vote on the final agreement, which means that even if they reject it we will leave and use wTO regulations. As for having access to the eu single market, that simply means being able to trade with it, something that would benefit the eu as we are the major importer from the eu 27, indeed Germany’s 3rd largest market in the world. It was a good riposte to Verhofstadt, he who is already out of the running to be President of the eu parliament, and his threats to us. Nothing about that speech was good! Well the simple to understand point is that we want to be able to access the nations in the single market to trade with them, which would be in their best interests, but not have all the unnecessary nonsense that currently goes with it, just like 161 other non eu and non special agreement nations do, not difficult to understand really. Everybody has access to the single market, though. It’s just that only 28 (soon to be 27) states have access without paying for the privilege. They all pay to access other countries’ markets too. The difference is that, in the single market, we don’t. Well as the reu nations would have to pay to access our market and they sell more to us than we do to them it wouldn’t be in their best interest to impose taxes on us because the reciprocal action would lose them their largest export market. Mrs May’s diagnosis is known to cause generalised cognitive deficit in terms of speed and flexibility in thinking. It also heightens risk of vascular disorder and Alzheimer’s dementia for the patient. I am all for inclusion, also very much for the proposition that those us who are handicapped should recognise our limitations. Well unless you have medical qualifications your medical diagnosis, which is clearly incorrect anyway, is a pointless waste of time for you to post. Clearly the irony of the poster “A Global Britain” from a politician who wants to keep foreign people out of the country is lost on May. Clearly the idea of being able to trade globally without having to ask ask for permission from an unelected committee in brussels or having to accept the unemployed form the nations we are trading with is above your level of cognitive ability. It is in no way ironic whatsoever. Don’t insult other commenters, please!